It is hard to believe that Yay Bingo has only been operating since April 2018. This young website has already established itself in the competitive world of online bingo by offering their players many unique advantages, amazing weekly bonuses, exceptionally fun game play and a wide variety of other captivating factors. As such, they have impressed players, critics and reviewers alike with their fresh take on bingo. Yay Bingo is powered by Dragonfish, a well-trusted name in the industry that successfully provides bingo platforms for many other sites. 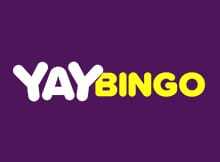 The operators of Yay Bingo are none other than Cassava Enterprises and the brand falls under the 888 Group with their head office situated in Gibraltar. Yay Bingo has a welcome bonus that is certainly inviting. Yay Bingo welcomes their players by giving them £70 when signing up. In order to claim the bonus, players need to use the code YAY and deposit £10. The free £70 that players receive is split up with 60 tickets to a value of £30 is allocated for the Street Party bingo room. The remaining funds of £40 are allocated for you to play with in the Big Bang bingo room. These rooms are themed differently and each has a unique feel. If you are a slots enthusiast there is yet another surprise in store for you and it comes in the form of 10 spins on one of Yay Bingo’s slot games for free. This is definitely a welcome bonus worth talking about! The overall appearance of the site is definitely aesthetically pleasing to say the least. While the design team have used the bright colours of aqua, purple, pink and yellow, it is in no way overbearing and feels unique in comparison to other bingo sites out there. The images are fun and vibrant and the site gives off the feel of a summer holiday! With all the happiness this site exuberates, Yay Bingo is definitely an appropriate name. Slot games are definitely one of the most entertaining games to play and they come in a wide variety of themes and styles. Yay Bingo provides its players with a great variety of slot games to choose from and even pay homage to their slot collection by giving players 10 free spins as part of the welcome bonus. Some of the famous games you can expect include Rainbow Riches, Cleopatra, Piggy Payouts and Siberian Storm. There is also a wide array of new games, such as the Love Island slot based on the popular UK dating show. At Yay Bingo, you’ll find all of the most popular deposit methods available, including prepaid cards and eWallets. More conventional methods include debit and credit cards (Visa and MasterCard), bank transfers and popular payment facilitators like PayPal. The method that requires the most time and effort is probably a wire transfer, but it is still available for those who want it. Withdrawing funds is as easy as it could be with Yay Bingo. They provide many options and there is no minimum amount, which is a bit of a change in comparison to competitors. All payments made through this site are very secure and you can feel safe making payments that are secured through specialised encryption processes. Mobile players delight! Yay Bingo has taken the vast number of mobile players into consideration when designing there site, which is totally mobile friendly. Whether your cell phone operates using Android or iOS, the site should be easy to navigate and fit the screen perfectly thanks to the talented people at Dragonfish. The majority of the games found on Yay Bingo can be played on mobile. Yay Bingo’s major advantage is that it’s clear that they have kept the player in mind when designing this site and that is a sure-fire way to ensure players keep coming back for more. The bingo site is set apart from competitors by their lack of withdrawal limits and wagering amounts. In addition to this, the generous welcome bonus is another plus for first time players. Mobile friendliness is yet another massive factor that have considered and tackled, allowing mobile players to be part of the fun. With a trendy feel and ease of play, Yay Bingo is definitely headed towards success. The customer service of Yay Bingo is operated between 10AM to 2AM, 7 days a week to assist you with any questions you may have, either via live chat, e-mail or telephone. All calls to from within the United Kingdom are free. The platform has an extensive and informative FAQ- section.